Sergeant Leonard Luna was killed in a motorcycle accident on I-105, near Long Beach Boulevard in Lynwood, while en route to pickup his issued motorcycle from the repair shop in Long Beach. Another vehicle struck his motorcycle, causing him to suffer serious injuries. He was transported to St. Francis Medical Center where he succumbed to his injuries. 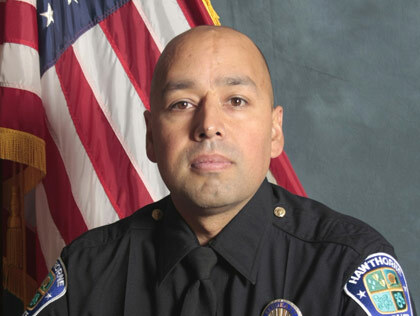 Sergeant Luna had served with the Hawthorne Police Department for 10 years and served as the agency's Traffic Bureau commander. He is survived by his parents and brother. I still think of you all the time my friend and try to stay in touch with your family. Sometimes I pass by "It's a Grind" and can still see us sitting there sipping coffee's, laughing and BS'ing about work, our families and life. I still ride, but it hasn't been the same without you to share those long roads with. There will always be an ache in my heart for the brotherhood and camaraderie we shared on all those motorcycle trips. I always thought we would be riding together till we were both old and retired. You would be happy to know the department started a motorcycle safety program in your name called "Ride to Live" that has really taken off. It isn't easy to find true friends in this world, people who will stick by you through thick and thin. You were one such man and I am a better man for having met you.